Silk is a fine, soft and yet strong proteinaceous fiber that is naturally produced by certain arthropods, and with some forms, particularly that produced by the mulberry silkworm, Bombyx mori, woven into important and luxurious textiles. Silk is mostly composed of the insoluble protein fibroin, coated by a smaller amount of a water-soluble protective gum (sericin), as well as including small amounts of other substances. The shimmering appearance of fine silk is due to the triangular prism-like structure of the silk fiber, which allows silk cloth to refract incoming light at different angles, thus producing different colors. In addition to clothing, silk is used for a variety of uses, including upholstery, wall coverings, rugs, bedding and wall hangings. While the best-known and commercially important silk is obtained from the cocoons of the the domesticated moth Bombyx mori, commercial silks also are produced by two giant silkworms in the Saturnidae family, Samia cynthia and Antheraea pernyi. 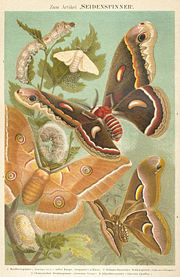 B. mori feeds solely on the leaves of mulberry trees and produces the finest, most lustrous fiber, while S. cynthia feeds on the leaves of the Ailanthus genus and produces a coarse but more durable and cheap silk, and A. pernyi, the Chinese tussah moth, is a major producer of wild silk (tussah silk), which is more difficult to dye. Silks are mainly produced by the larvae of insects undergoing complete metamorphosis, but also by some adult insects such as webspinners. 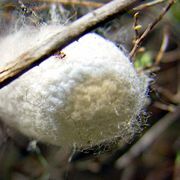 Silk production is especially common in the Hymenoptera (bees, wasps, and ants), and is sometimes used in nest construction. Other types of arthropods produce silk, most notably various arachnids such as spiders. Initially developed about 5000 years ago in China, for many years silk was a primary commodity traded by China with the West along the Silk Road, and the silk production process was a carefully guarded secret for thousands of years. The guarding of this secret, at threat of death, perhaps foreshadowed current ethical issues related to technology transfer and the intellectual property rights of states (state sovereignty) and corporations versus the common heritage of humanity. Today, at least 70 million pounds of raw silk are produced each year in many nations, requiring nearly ten billion pounds of mulberry leaves. The annual world production represents 70 billion miles of silk filament, a distance well over 300 round trips to the sun. China remains by far the larger producer and exporter of silk. Silk fibers from the Bombyx mori silkworm have a triangular cross section with rounded corners, 5-10 μm wide. The fibroin-heavy chain is composed mostly of beta-sheets, due to a 59-mer amino acid repeat sequence with some variations. The flat surfaces of the fibrils reflect light at many angles, giving silk a natural shine. The cross-section from other silkworms can vary in shape and diameter: crescent-like for Anaphe and elongated wedge for tussah. Silkworm fibers are naturally extruded from two silkworm glands as a pair of primary filaments (brin), which are stuck together, with sericin proteins that act like glue, to form a bave. Bave diameters for tussah silk can reach 65 μm. See cited reference for cross-sectional SEM photographs. 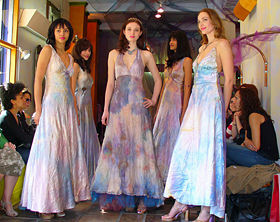 Unwashed silk chiffon may shrink up to 8% due to a relaxation of the fiber macrostructure. So silk should either be pre-washed prior to garment construction, or dry cleaned. Dry cleaning may still shrink the chiffon up to 4%. Occasionally, this shrinkage can be reversed by a gentle steaming with a press cloth. There is almost no gradual shrinkage nor shrinkage due to molecular-level deformation. The term "silkworm" refers to the larva or caterpillar of various species of moths. The most important commercial silkworm is Bombyx mori, which has been domesticated to the point that it is entirely dependent on humans for its reproduction and no longer occurs naturally in the wild. Known as the "domesticated silkworm" and as the "mulberry silkworm," B. mori, a member of the Bombycidae family of Lepidoptera, feeds solely on the leaves of mulberry trees. Silk moths lay eggs on specially prepared paper, with the females laying about 300 to 400 eggs each. The eggs hatch and the caterpillars (silkworms) are fed fresh, finely chopped mulberry leaves. After about 35 days and 4 moltings, the caterpillars are 10,000 times heavier than when hatched, having grown from about 3 millimeters in length to about 9 centimeters, and they are ready to begin spinning a cocoon. A straw frame is placed over the tray of caterpillars, and each caterpillar begins spinning a cocoon by moving its head in a "figure 8" pattern. Two glands produce liquid silk and force it through openings in the head called spinnerets. Liquid silk is coated in sericin, a water-soluble protective gum, and solidifies on contact with the air. Within two to three days, the caterpillar spins about 1 mile of filament and is completely encased in a cocoon. The cocoon of the domesticated silkworm is composed of a single, continuous thread of raw silk from 300 to 900 meters (1000 to 3000 feet) long. The fibers are very fine and lustrous, about ten micrometers (1/2500th of an inch) in diameter. If the pupating moth is allowed to survive after spinning its cocoon, it will release proteolytic enzymes to make a hole in the cocoon so that it can emerge as a moth. This would cut short the threads and ruin the silk. Instead, commercially reared silkworm pupae are killed before the adult moths emerge, typically by heat, such as boiling water, but the pupae also may be pierced with a needle rather than boiling. This allows the whole cocoon to be unraveled as one continuous thread and allows a much stronger cloth to be woven from the silk. Often, the silkworm itself is eaten or used for other purposes (fertilizer, fish food, etc.). Some are not killed, allowing them to metamorphose into moths to breed the next generation of caterpillars. Harvested cocoons are soaked in boiling water to soften the sericin holding the silk fibers together in a cocoon shape; in other words, the boiling water makes the cocoons easier to unravel, loosing the gum part of the raw fiber. The fibers are then unwound to produce a continuous thread. Since a single thread is too fine and fragile for commercial use, anywhere from three to ten strands are spun together to form a single thread of silk. Using a rough figure of one kilometer of silk (about 3300 feet) per cocoon, ten unraveled cocoons could theoretically extend vertically to the height of Mt Everest. About 2,000 to 3,000 cocoons are required to make a pound of silk, or roughly 1,000 miles of filament.. To produce 1 kilogram of silk, 104 kilograms of mulberry leaves must be eaten by 3000 silkworms. It takes about 5000 silkworms to make a pure silk kimono. The cultivation of silk is called sericulture. Silk culture has been practiced for at least 5,000 years in China. While other Lepidoptera produce cocoons, only a few large Bombycidae and Saturniidae have been exploited for fabric production. In particular, other than B. mori, the main other silk producers are two giant silkworms in the Saturnidae family, Samia cynthia and Antheraea pernyi. S. cynthia is known as the ailanthus silkmoth, since it feeds on the leaves of the Ailanthus genus. It produces a coarse silk, but one that is more durable and cheaper than mulberry silk. A. pernyi is known as the Chinese tussah moth, is a major producer of another variety of wild silk (tussah silk). Wild silks, or tussah silks (also spelled "tasar"), are those produced by caterpillars other than B. mori. They are called "wild" as the silkworms cannot be artificially cultivated like the mulberry silkworm. A variety of wild silks have been known and used in China, India, and Europe from early times, although the scale of production has always been far smaller than that of cultivated silks. Aside from differences in colors and textures, the wild silks all differ in one major aspect from the domesticated varieties: The cocoons that are gathered in the wild have usually already been damaged by the emerging moth before the cocoons are gathered, and thus the single thread that makes up the cocoon has been torn into shorter lengths. Wild silks also tend to be more difficult to dye than silk from the cultivated silkworms. Over 30 countries produce silk. The major ones are China (54%) and India (14%). 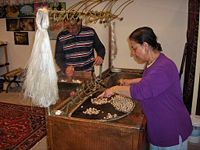 Silk filaments being unraveled from silk cocoons, Cappadocia, Turkey, 2007. Silk is particularly renowned for its use in making luxury fabrics. Silk's absorbency makes it comfortable to wear in warm weather and when one is active. Its low conductivity keeps warm air close to the skin during cold weather. It is often used for clothing such as shirts, ties, blouses, formal dresses, high fashion clothes, lingerie, pyjamas, robes, dress suits, sun dresses and kimonos. Silk's attractive luster and drape makes it suitable for many furnishing applications. It is used for upholstery, wall coverings, window treatments (if blended with another fiber), rugs, bedding and wall hangings. In particular, leftover silk produced in the process of making silk thread (yarn) may be spun to produce a somewhat inferior silk used for some fabrics and waste silk may used for things like upholstery and draperies. While on the decline now, due to artificial fibers, silk has had many industrial and commercial uses; parachutes, bicycle tires, comforter filling and artillery gunpowder bags. A special manufacturing process removes the outer irritant sericin coating of the silk, which makes it suitable as non-absorbable surgical sutures. This process has also recently led to the introduction of specialist silk underclothing for children and adults with eczema where it can significantly reduce itch. Woven silk textile from tomb no 1. at Mawangdui in Changsha, Hunan province, China, from the Western Han Dynasty, 2nd century B.C.E. Landscape of quick water from high mountain by Zhao Zho, Ming Dynasty, 1611 C.E. Hand scroll, ink and color on silk. Silk fabric was first developed in ancient China, with some of the earliest archaeological evidence being parts of a primitive loom dated to about 4900 B.C.E. found in Zhejiang province; silk fabric wrappings around the body of child found in Henan province and dated to around 3500 B.C.E. ; and parts of a machine for reeling silk found in a Neolithic site in Zhejiang province dated to about 2,750 B.C.E., where early fragments of silk were also found. In addition, the silkworm appears as a decorative motif on Neolithic sculptures, and in Shanxi province there was a finding, dated to 5,600 to 6000 years ago, of a silk cocoon cut in half by a sharp instrument. It is generally accepted that silk was used to produce garments at least 5,000 years ago. In addition, in 2007, archeologists discovered in a tomb in Jiangxi province evidence of a burgeoning textile industry dated to the Eastern Zhou Dynasty roughly 2,500 years ago, with stunningly dyed and intricately woven silk textiles. Although historians have suspected a long history of a formative textile industry in ancient China, this finding of silk textiles employing "complicated techniques" of weaving and dyeing provides direct and concrete evidence for a textile industry. Legend gives credit for developing silk to a Chinese empress, Lei Zu (Hsi-Ling-Shih, Lei-Tzu, Si-Ling), the wife of the Yellow Emperor, in the 27th century B.C.E. Silks were originally reserved for the Kings of China for their own use and gifts to others, but spread gradually through Chinese culture and trade both geographically and socially, and then to many regions of Asia. Silk rapidly became a popular luxury fabric in the many areas accessible to Chinese merchants because of its texture and luster. Silk was in great demand, and became a staple of pre-industrial international trade. The first evidence of the silk trade is the finding of silk in the hair of an Egyptian mummy of the 21st dynasty, circa 1070 B.C.E. Ultimately, the silk trade reached as far as the Indian subcontinent, the Middle East, Europe, and North Africa. This trade was so extensive that the major set of trade routes between Europe and Asia has become known as the Silk Road. The Emperors of China strove for millennia to keep knowledge of sericulture secret to maintain the Chinese monopoly, with the threat of death by torture to anyone sharing the technology or exporting silkworm eggs. This secret was closely and successfully guarded for many centuries. Nonetheless sericulture reached Korea around 200 B.C.E., and about the first half of the 1st century CE had reached the ancient, Buddhist Kingdom of Khotan, which was then outside of Chinese rule.. Allegedly, silkworm eggs were smuggled to Khotan in the hairdo of a Chinese princess sent to marry the Emperor of Khotan. Successful industries had been established in Japan and India by at least 300 C.E. and 400 C.E., respectively, although various accounts provide even earlier dates for introduction. Silk is produced, year round, in Thailand by two types of silkworms, the cultured Bombycidae and wild Saturniidae. Most production is after the rice harvest in the southern and northeast parts of the country. Women traditionally weave silk on hand looms, and pass the skill on to their daughters as weaving is considered to be a sign of maturity and eligibility for marriage. Thai silk textiles often use complicated patterns in various colors and styles. Most regions of Thailand have their own typical silks. A single thread filament is too thin to use on its own so women combine many threads to produce a thicker, usable fiber. They do this by hand-reeling the threads onto a wooden spindle to produce a uniform strand of raw silk. 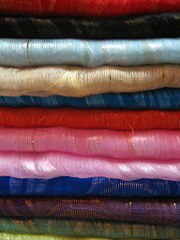 The process takes around 40 hours to produce a half kilogram of Thai silk. Silk, known as "Paat" in Eastern India, Pattu in southern parts of India and Resham in Hindi/Urdu, has a long history in India. Recent archaeological discoveries in Harappa and Chanhu-daro suggest that sericulture, employing wild silk threads from native silkworm species, existed in South Asia during the time of the Indus Valley Civilization, roughly contemporaneous with the earliest known silk use in China, with silk fibers of the Indus Civilization dated to 2450 to 2000 B.C.E. Silk is widely produced today. India is the second largest producer of silk after China, although most is consumed domestically. India is the largest consumer of silk in the world. The tradition of wearing silk sarees in marriages by the brides is followed in southern parts of India. Silk is worn by people as a symbol of royalty while attending functions and during festivals. Historically, silk was used by the upper classes, while cotton was used by the poorer classes. A majority of the silk in India is produced in Karnataka State, particularly in Mysore and the North Bangalore regions of Muddenahalli, Kanivenarayanapura, and Doddaballapur; 65% of India's raw silk is produced in Karnataka State. Notable production is found in such cities as Bhoodhan Pochampally (also known as Silk City), Kanchipuram, Dharmavaram, Mysore, and so forth in South India and Banaras in the North for manufacturing garments and sarees. "Murshidabad silk", famous from historical times, is mainly produced in Malda and Murshidabad districts of West Bengal and woven with hand looms in Birbhum and Murshidabad districts. Another place famous for production of silk is Bhagalpur. The silk from Pochampally is particularly well-known for its classic designs and enduring quality. The silk is traditionally hand-woven and hand-dyed and usually also has silver threads woven into the cloth. Most of this silk is used to make sarees. The sarees usually are very expensive and vibrant in color. Garments made from silk form an integral part of Indian weddings and other celebrations. In the northeastern state of Assam, three different types of silk are produced, collectively called Assam silk: Muga, Eri and Pat silk. Muga, the golden silk, and Eri are produced by silkworms that are native only to Assam. The heritage of silk rearing and weaving is very old and continues today especially with the production of Muga and Pat riha and mekhela chador, the three-piece silk sarees woven with traditional motifs. Mysore Silk Sarees, which are known for their soft texture, last many years if carefully maintained. In Islamic teachings, Muslim men are forbidden to wear silk. Many religious jurists believe the reasoning behind the prohibition lies in avoiding clothing for men that can be considered feminine or extravagant. There are disputes regarding the amount of silk a fabric can consist of (i.e., whether a small decorative silk piece on a cotton caftan is permissible or not) for it to be lawful for men to wear, but the dominant opinion of many Muslim scholars is that the wearing of silk for men is forbidden. In the Greek epic poem [Odyssey]], which was probably composed near the end of the 8th century B.C.E., there is a verse that seems to reference silk. In this verse, when Odysseus, while pretending to be someone else, is questioned by Penelope about her husband's clothing, he says that Odysseus wore a shirt "gleaming like the skin of a dried onion," (19.233-234; varies with translations, literal translation here) which could refer to the lustrous quality of silk fabric. Alexander the Great (356-323 B.C.E.) 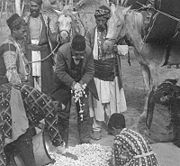 was involved in introducing silk into Europe via the Silk Road, as a result of the expansion of his empire into Central Asia and the founding, in 329 B.C.E., of the city of Alexandria Eschate, a major staging point on the northern Silk Road. 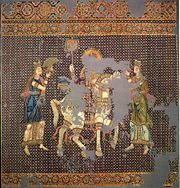 The transport and trade of silk, among other luxuries, between China and Greek, Roman, and Byzantine civilizations was enabled greatly by the Silk Road. The Roman Empire knew of and traded in silk. During the reign of emperor Tiberius, sumptuary laws were passed that forbade men from wearing silk garments, but these proved ineffectual. 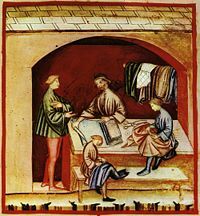 Despite the popularity of silk, the secret of silk-making only reached Europe around 550 C.E., via the Byzantine Empire. Legend has it that two monks, encouraged by emperor Justinian I, smuggled silkworm eggs and mulberry seeds into Constantinople (Istanbul) in hollow canes from China. With the support of the church and state, Byzantium became well-known for its silken textiles. Originally, all top-quality looms and weavers were located inside the Palace complex in Constantinople and the cloth produced was used in imperial robes or in diplomacy, as gifts to foreign dignitaries. The remainder was sold at very high prices. Venetian merchants traded extensively in silk and encouraged silk growers to settle in Italy. By the 13th century, Italian silk was a significant source of trade. Since that period, the silk worked in the province of Como has been among the most valuable silk in the world. The wealth of Florence was largely built on textiles, both wool and silk, and other cities like Lucca also grew rich on the trade. Italian silk was so popular in Europe that Francis I of France invited Armenian silk makers to France to create a French silk industry, especially in Lyon. Mass emigration (especially of Huguenots) during periods of religious dispute had seriously damaged French industry and introduced these various textile industries, including silk, to other countries. Silk was expensive in Medieval Europe and used only by the rich. Italian merchants like Giovanni Arnolfini became hugely wealthy trading it to the Courts of Northern Europe. James I attempted to establish silk production in England, purchasing and planting 100,000 mulberry trees, some on land adjacent to Hampton Court Palace, but they were of a species unsuited to the silk worms, and the attempt failed. In 1717, John Lombe, visited Piedmont and returned to England with details of the Italian machines, and some Italian craftsmen. He was granted a fourteen year patent, and built Lombe's Mill in Derby. The King of Sardinia retaliated by prohibiting the export of raw silk. Nevertheless, in 1732 John Guardivaglio set up a silk throwing enterprise at LogwoodMmill in Stockport, and in 1744, Burton Mill was erected in Macclesfield, and in 1753 Old Mill was built in Congleton.. These three towns remained the center of the English silk throwing industry until silk throwing was replaced by silk waste spinning. British enterprise also established silk filature in Cyprus in 1928. In England in the mid 20th Century, raw silk was produced at Lullingstone Castle in Kent. Silkworms were raised and silk reeled under the direction of Zoe Lady Hart Dyke. Production started elsewhere later. In Italy, the Stazione Bacologica Sperimentale was founded in Padua in 1871 to research sericulture. In the late 19th century, China, Japan, and Italy were the major producers of silk. James I of England introduced silk-growing to the American colonies around 1619, ostensibly to discourage tobacco planting. The Shakers in Kentucky adopted the practice. 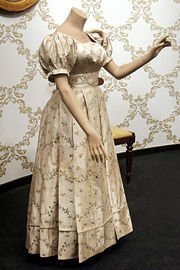 Dring the early 1800s, in many areas of the United States including New England, silkworm culture and production of silk was a household industry. Also in the 19th century, an attempt at a silk industry began with European-born workers in Paterson, New Jersey, and the city became a US silk center, although Japanese imports were still more important. World War II interrupted the silk trade from Japan. Silk prices increased dramatically, and US industry began to look for substitutes, which led to the use of synthetics such as nylon. Synthetic silks have also been made from lyocell, a type of cellulose fiber, and are often difficult to distinguish from real silk. As the process of harvesting the silk from the cocoon kills the larvae, sericulture has been criticized in the early 21st century by animal rights activists, especially since artificial silks are available. This concerns includes research into spider silk to find a way to harness its strength and flexibility. Mohandas Gandhi was also critical of silk production based on the Ahimsa philosophy "not to hurt any living thing." This led to Gandhi's promotion of cotton spinning machines, an example of which can be seen at the Gandhi Institute. He also promoted Ahimsa silk, wild silk made from the cocoons of wild and semi-wild silk moths. Ahimsa silk is promoted in parts of Southern India for those who prefer not to wear silk produced by killing silkworms. ↑ M. Lewin (ed. ), Handbook of Fiber Chemistry, 3rd ed. (CRC press, 2006). ISBN 0824725654. ↑ M. Lewin (ed. ), Handbook of Fiber Chemistry, 2nd ed. (Marcel Dekker, 1998). ISBN 0824794710. ↑ F. K. Ko, S. Kawabata, M. Inoue, M. Niwa, S. Fossey, and J. W. Song, "Engineering properties of spider silk," (MIT). Retrieved February 12, 2011. ↑ F. K. Ko, "Engineering properties of spider silk fibers," Chapter 3, pages 27-49, in F. T. Wallengberger and N. Weston, Plastics and Composites (Dordrecht, Netherlands: Kluwer Academic Publishers, 2004). ISBN 1402076436. ↑ C. Gleason, The Biography of Silk (Crabtree Publishing Company, 2007). ISBN 0778724875. ↑ E. L. Palmer, Fieldbook of Natural History (New York: Whittlesey House, 1949). ↑ A. Fritz and J. Cant, Consumer Textiles (Australia: Oxford University Press, 1986). ISBN 0195546474. ↑ M. R. Goldsmith, T. Shimada, and H. Abe, "The genetics and genomics of the silkworm, Bombyx mori," Annu. Rev. Entomol. 50(2004): 71-100. Retrieved February 12, 2011. ↑ 9.0 9.1 9.2 G. C. C. Tsang, "Textile Exhibition: Introduction," Asianart.com. Retrieved February 13, 2011. ↑ People's Daily Online, "Chinese archaeologists make ground-breaking textile discovery in 2,500-year-old tomb," People's Daily Online July 31, 2007. Retrieved February 13, 2011. ↑ G. Lubec, J. Holaubek, C. Feldl, B. Lubec, and E. Strouhal, "Use of silk in ancient Egypt," Nature 362 (1993), iss. 6415: 25. ↑ I. L. Good, J. M. Kenoyer, and R. H. Meadow, "New evidence for early silk in the Indus civilization," Archaeometry 50(2009): 457. Retrieved February 13, 2011. ↑ Deccan Herald, "Silk city to come up near B’lore," Deccan Herald October 16, 2009. Retrieved February 13, 2011. ↑ S. al-Oadah, "Ruling on men's neckties and on men wearing silk," IslamToday.net (no date). Retrieved February 14, 2011. ↑ <B. Negi, Muslim men not to wear silk & gold : Quran," TheMuslimWomen.org October 27, 2005. Retrieved February 14, 2011. ↑ Y. Al-Qaradawi, "Gold and pure silk are forbidden for men: why?" Islamonline.net February 21, 2003. Retrieved February 14, 2011. ↑ Cornelius Tactius, The Reign of Tiberius, Out of the First Six Annals of Tacitus, Project Gutenberg. (New York : Cambridge University Press, 1989; originally written in first century C.E.) ISBN: 0521315433. Retrieved February 14, 2011. ↑ K. A. Berney, C. Hudson, et. al, International Dictionary of Historical Places, volume 4, Middle East & Africa (Chicago: Fitzroy Deadborn, 1996). ISBN 1884564044. ↑ A. Callandine, "Lombe's Mill: An exercise in reconstruction," Industrial Archaelogy Review XVI(1993). ↑ H. Rayner, Silk Throwing and Waste Silk Spinning (London: Scott, Greenwood, Van Nostrand, 1903). ↑ L. P. Brockett, "The early silk dyeing industry," from L. P. Brockett's The Silk Industry in America (Silk Association of America 1876). Retrieved February 14, 2011. ↑ PETA, "Down and silk: Birds and insects exploited for fabric," PETA (no date). Retrieved February 14, 2011. ↑ H. G. Alexander and the National Committee for the Gandhi Centenary, Mahatma Gandhi: 100 years, (Orient Longmans, 1968). Retrieved February 14, 2011. ↑ D. Parekh, "Silk saree without killing a single silkworm," The Better India September 11, 2008. Retrieved February 14, 2011. Good, I. 1995. On the question of silk in pre-Han Eurasia. Antiquity 69(1995), iss. 266: 959–968. Yu Huan. 429 C.E. (Tran. 2004 by J. E. Hill.) The Peoples of the West from the Weilüe by Yu Huan. A Third Century Chinese Account Composed between 239 and 265 C.E. Draft annotated English translation. Appendix E. Retrieved February 15, 2011. Kuhn, D. 1995. “Silk Weaving in Ancient China: From Geometric Figures to Patterns of Pictorial Likeness.” Chinese Science 12:77–114. Liu, Xinru. 2007. Silk and Religion: An Exploration of Material Life and the Thought of People, AD 600-1200. New Delhi : Oxford University Press. ISBN 0195644522. Liu, Xinru. 2010. The Silk Road in World History. New York: Oxford University Press. ISBN 9780195161748. A series of maps depicting the Global Trade in Silk. New thread in fabric of insect silks | physorg.com.